What is an object worth? How much do you want it and what are you prepared to give in return? According to the dictionary 'In times of monetary crisis, barter usually replaces money as the method of exchange.' We haven't quite reached that point yet, but in the current economic climate, it might be as well to prepare ourselves. 10x10 explores the theme of value and worth. 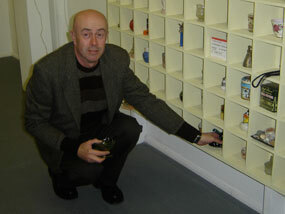 An ongoing project, it was launched in 2008 and consists of an ever-changing display of 100 objects. Wherever it goes, people are asked to take one item and leave something in its place. 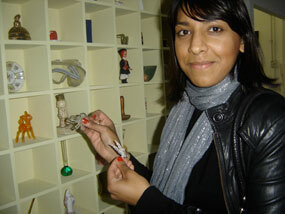 The theme for the 10th anniversary of the Deptford X art festival in 2008 was currency and trade. 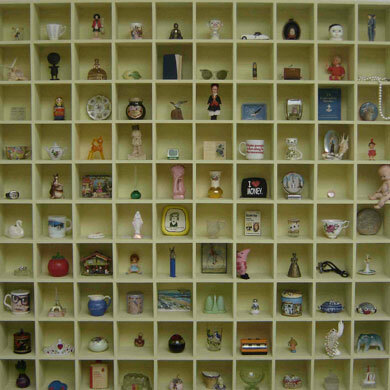 In response, I submitted a piece of work, 10x10, which featured one hundred objects which were precious to me. From 10am to 10pm on October 10th these treasured items were up for grabs, but there was a proviso; if you took something you had to leave something in its place. Only one swap per person was allowed. The objects left were similarly available for exchange. By the end of the day, thanks to the people who took part, a new work of art was created. This then remained on display for the duration of Deptford X. 10x10 was first inspired by the North American pack rat, a small rodent that I became fascinated with some years ago while living in upstate New York. Pack rats (also the name given to obsessive collectors!) have a habit of leaving objects behind in place of the things that they take. A friend's reaction to my description of 10x10 was that it would be 'a comment on humanity' and as the day unfolded, the truth of this remark became clear. The very act of bartering adds an emotional reality to the process of exchange that currency somehow lacks. Would it be people's generosity or meanness that triumphed when it came to the value of the objects that were bartered? Would the piece be 'worth more' at the end of the process? Two young women arrived together. They came with a sense of purpose and spent nearly an hour arranging and rearranging the objects they wanted to leave behind, taking numerous photographs in the process. A lot of precious things were left behind - that much was evident in the body language and sentiments expressed as the exchanges were taking place. There were some inventive swaps; artist Mick Armson left a beautiful sketch of the object that he took, in this case a perpetual New York souvenir calendar. Some people wanted to share the story attached to their exchange; some didn't. Some seemed to be asking for my approval of what they proposed to leave. Most people had obviously thought the whole process through very carefully. Other exchanges were (at least on the surface) less emotional and more straightforward. 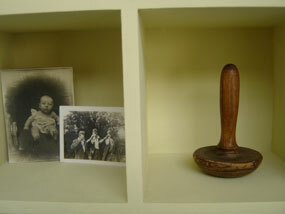 Several of the hundred spaces in the 10x10 cabinet saw more than one swap being made - my blue wooden car was exchanged for a ceramic box 'made from a pressing of a wooden WW1 box used in France for sending objects by post.' 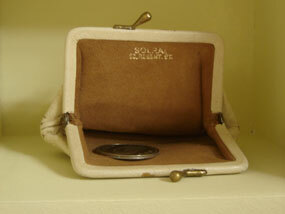 This in turn was taken and a Chinese sewing pin cushion 'in memory of my Grandmother' was left in its place. And in response to the memory of another Grandmother, Chinese spirit money was subsequently exchanged for the pin cushion. In the end, what was taken and what was left seemed in some ways irrelevant. The process itself was what was important. It clearly made people think about the emotional attachment we make to objects - both negative and positive. One woman left a shine-in-the-dark star which had been removed from her son's ceiling while decorating. The sentiment expressed - 'He's now too old for it' - was heartfelt. I know because she shared her sadness with me. On the surface, a small plastic star, easily replaceable. But not her son's age - that couldn't be turned back. Another person gave up a small embroidery set that she had bought 15 years or so ago... 'I will never be the sort of person who will turn it into something beautiful,' she wrote - 'I'll leave that to someone else.' And I know (because she told me!) that it almost broke the heart of one woman to leave her dolly from her doll's house days behind. But she did leave it - she was generous enough to do so. At the end of the day a total of sixty swaps had been made, and forty three of my original objects had gone. The impact of saying goodbye to some of them was greater than I had imagined. I felt a pang as my doll with the red dress and matching hair ribbon was taken from her place. I'd much rather that someone had taken the Littlehampton jug with all the painful memories it evoked. When I first thought of 10x10, I had no idea how it would turn out. Would the people who came along participate in a thoughtful and creative way? Or would they - as some people speculated - simply 'take the piss' and help themselves to something they fancied in return for an old toenail clipping? In the event, I was struck not just by the things that people were prepared to leave behind, but by the accompanying stories of what they represented. For many of the people who took part, the exchanges came from the heart. If 10x10 was a comment on humanity, then humanity came out of it pretty well. When the original 10x10 cabinet was set up, I invested a lot of time, thought and energy into the aesthetic appeal of it - the colour chosen for the cabinet was given a lot of consideration and the objects were carefully placed so that the colours and the shapes and sizes complemented each other. 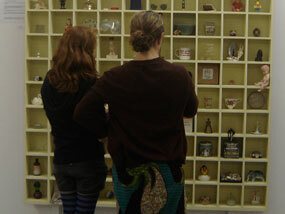 When I first presented them, the 100 objects looked visually stunning to me. This of course was all to change once the exchange process took place and I then found myself in a position of having to tolerate changes I didn't particularly like. As well as letting go of the individual objects and their emotional connections, I also had to let go of having control over how a piece of work took shape. Since its original launch at Deptford X, the 10x10 cabinet has travelled to Lewisham, Herne Bay, Whitstable, Hastings and Colchester. Hundreds of exchanges have been made, and many fascinating stories have been left along with the objects that people have brought. Only one of the original 100 objects remains!